Fred started Kyokushin Karate-do in 1976 at the age of 14 at the Budo school Shin Bu Ken of Jan Kallenbach [a well known former European Karate champion]. Fred received his Shodan in Karate in 1979 and his Nidan in 1982. During his Karate-training he became acquainted with the Bo [long staff 180 cm] and Jo. In 1980 a Japanese group with Otake Sensei, Kaminoda Sensei and Draeger Sensei made a European tour and were invited in The Netherlands by Mr. Kallenbach. Beside the Katori Ryu demonstrations by Otake Sensei and his group, Draeger Sensei and Kaminoda Sensei performed techniques of the Shinto Muso Ryu Jodo. That's where Fred was introduced to the Shinto Muso Ryu Jodo and received his first teaching in Jo. Two years after  Christopher Sanmugam from Malaysia, a high level Jodo-trainee and a student of Draeger Sensei, came to Holland and during his stay he taught Jodo at Mr. Kallenbach's dojo. 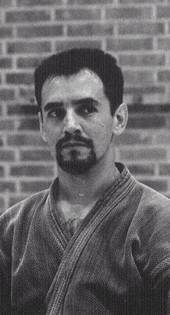 Fred followed his teachings as much as possible and helped him with his teachings in other dojo around Holland. At the end of his stay in Holland, Christopher went to Sweden to Mr. McDonagh, a good friend of Mr. Kallenbach. Fred followed him, sponsored by his dojo, and for two weeks he had a daily training with Christopher and a few other Swedish trainees in the dojo of Mr. McDonagh [that's where he met Michael Soderkvist, who is responsible for EJF Jodo in Sweden]. Back in The Netherlands, Mr. Kallenbach helped him to set up a separate Jodo-training and started to teach. Fred met Pascal Krieger in 1983, when he was invited by Mr. Kallenbach to the Shin Bu Ken Budo-gasshuku in Vierhouten - The Netherlands. That same year Fred attended the first European Jodo summer gasshuku organized by Pascal Krieger at Le Brassus - Switzerland. Since that time he never missed one. In 1985 Fred received his Shodan, during the 3rd International Jodo Jamboree at Penang - Malaysia. An IJF Shoden teaching license was given to him in 1988 at the 4th International Jodo Jamboree at Le Brassus - Switzerland. In 1991 Fred had the intention to participate in the Kagamibiraki [traditional New Year weekend training] in Geneva - Switzerland, but had to go back to The Netherlands the very day he arrived. His pregnant wife gave birth, one month too soon to his son Maurice the first day of that Kagamibiraki! His daughter Lois was born on the first day of the Shin Bu Ken Budo-gasshuku in Amsterdam in 1992. In 1994 Fred received his 4th Dan and the traditional Oku-iri grade, during the 6th International Jodo Jamboree at Hawaii. That's where he met for the first time Nishioka Tsuneo Sensei. Since then Sensei Nishioka has been visiting The Netherlands every year, except for 1996 when he was in Bogeve - France. The traditional Shomokuroku grade was given to Fred at Heidelberg - Germany in 1997. At Lignano in Italy, he received his Gomokuroku certificate from the hands of Pascal Krieger in August 2004. In 2011 he receives the final teaching certificat 'Menkyo Kaiden' from Pascal Krieger Sensei.